Animal Planet's 'Must Love Cats'! 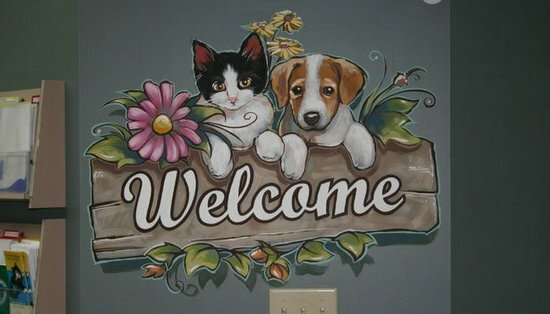 Fine Art, Murals, Faux Finishes, custom portraits and more! custom oil portraits which can be the perfect touch and the perfect gift for someone special. Did you know that you can transform your kitchen in to an Italian Villa with faux wall finishes and murals? Have your dining room become an open air solarium with a cloud ceiling, transform your child's room to a raceway or princess fairyland..anything is possible with murals and faux! I also provide elegant and unique wall finishes from Venetian Plaster to hand made wall paper. Stone, leather, brick..your walls can become anything you can imagine! Businesses can add interest, gain customers and clients with creative use of murals and faux finishes! Restaurants, bars, night clubs, hair salons, gyms, doctors and dentist's offices, vets, ANYPLACE can benefit from the surprise of murals or faux! Please use the tabs above to surf through this site, see hundreds of photos and enjoy looking for ideas and inspiration! Let me know what I can do for you! Contact me at [email protected]. I'm so happy to be living here in New Mexico and have my work displayed and for sale at the Amapola Gallery on Romero Street in Old Town, Albuquerque! Come visit and see my work along with over 40 other incredibly talented local artists! !